The Norse mythology had a powerful Odin god, who was the master of the Valkyries. He had two ravens named Huginn and Muninn. Their names, if translated, meant “thought” and “memory”. They flew all over the world and brought information about what was happening to Odin. The God of War gave speech to his of birds. For Germanic people, the raven is a symbol of hidden knowledge. On our website, you buy Raven Bronze Pendant Viking Amulet, which is not only jewelry, but also a talisman of sorts. The cord is very soft and comfortable; it will not cause skin irritation and will securely hold the pendant. The bronze pendant is delivered on a strong cord. Each and every detail of this unusual jewelry was carefully elaborated. The raven is a symbol of wisdom and knowledge. The scientists have proved that this bird can actually master human speech on a five-year-old child’s level. Raven Bronze Pendant Viking Amulet viking-workshop is an excellent opportunity to buy a special gift for a loved one. The skilled craftsmen will carefully work through every detail of the jewelry. You can receive your pendant in a branded package. Any lover of the Scandinavian culture and not only will be able to see the value in this adornment. In addition, on our website, you can find a wide range of other pendants. According to legends, it is believed that the wearer of an amulet or talisman should like it – that is when it will work and help him. It is important to make gifts of substance, then they will accord more pleasure. Raven Bronze Pendant Viking Amulet for sale is always available and may become such a gift. Just place your order and it will be manufactured and sent within five days. We deliver worldwide. In addition, on our site, you can find the Raven Ring that may enhance the protection. 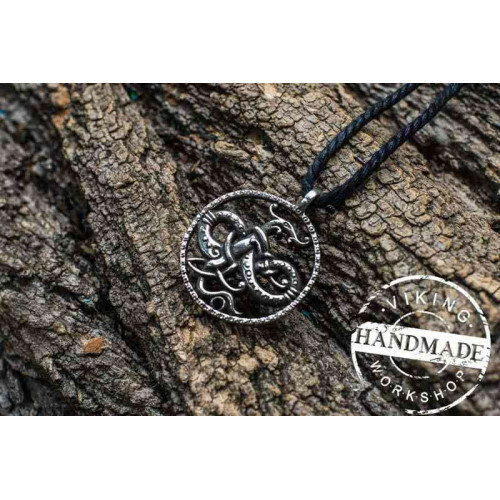 If you like Scandinavian culture, then you will love our jewelry. Choose the best for you and your loved ones.